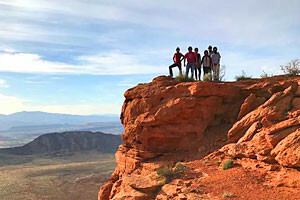 Mystery Canyon includes rappels, swims, down-climbs and other challenges to make the route enjoyable. Years of development and use have left numerous anchors to increase safety and ease of use. 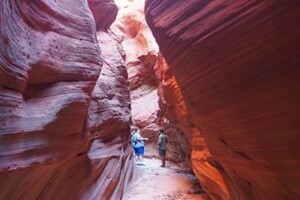 Along with The Subway, Mystery Canyon is the most popular canyoneering route in Zion. Due to high demand, permits are awarded based on a lottery system. As one of the most popular canyoneering routes in all of Zion, Mystery Canyon deserves the reputation it has gained over the years. The canyon was first descended decades ago, as is shown through the old, improvised anchors used by early canyoneers. It's no mystery why this would be an early route to develop for recreation. The canyon has everything: a narrow slot canyon with towering walls, rappels into springs, all finishing in the Temple of Sinawava for a postcard finish. After coursing through streams, pools, over and around boulders and other obstructions, the route ends with a final 120 ft. rappel over wet and slippery rock into Zion Narrows, not far from the trailhead. Try not to slip on the last rappel, as the tourists walking on the canyon floor will be sure to notice! For access to Mystery Canyon, Zion National Park requires a backcountry permit that is awarded by lottery. Be sure to put your name in the lottery three months before the planned departure. Reservations can be made online at http://zionpermits.nps.gov/ or call (435) 772-0170 for more information.